Gather your spices and know that your Golden Curry Kale is going to taste fabulous – just like it looks! With its sunny yellow color and tangled swirls of dark green kale, it’s a gorgeous looking bowl. And when those exotic spices hit the warm skillet, their lovely scent will cause people to come running. And the best part is that all this deliciousness is surprisingly simple to prepare. It only takes about 30 quick minutes, start to finish, to land you smack in the middle of curry wonderland! The fantastic flavors found in Golden Curry Kale stem from the happy marriage of pure and tasty ingredients. And the wedded bliss may have something to do with the particular step of coaxing the earthy aromatic spices. When I say coaxing, I just mean bringing the flavor forward through toasting over medium-high heat. But we’ll talk more about that in the cooking instructions. One spice you’ll be coaxing in this recipe is my beloved and currently trending turmeric. As you may have heard, turmeric relieves inflammation to such a degree that you can gain relief from a headache or joint pain by eating turmeric. Studies suggest that the curcumin in turmeric may potentially help prevent or even stop cancer cell growth. These little nuggets of stealthy health information are just the tip of the iceberg regarding the benefits of eating turmeric. To learn more about the vast benefits of the curcumin in turmeric, I suggest reading this article from NutritionFacts.org. Here are some of the other heavy nutritional hitters contributing to the genuine goodness of Golden Curry Kale. Curry powder is a favorite spice mix offering many valuable health benefits. It assists in the prevention of cancer, protection against heart diseases, and reduction in Alzheimer’s symptoms and pain and inflammation. It also improves the bone health, boosts immunity, and increases the liver’s ability to remove toxins from the body. And the kale is an excellent source of beta-carotene and vitamins C and E. Additionally; kale is a bountiful source of folate, calcium, iron, and potassium. It also contains bioflavonoids and other valuable components that protect against cancer. Tofu is a valuable plant-based source of protein that is reported to help lower “bad” LDL cholesterol. It may offer relief for specific symptoms of menopause, and it’s low in calories. An entire block of tofu has around 175 calories or so and provides about four to five servings of protein. 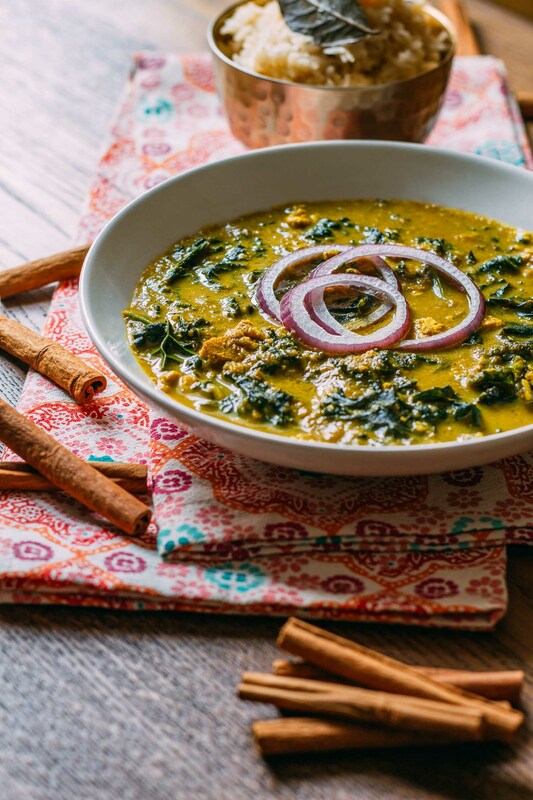 The wide array of nutritional benefits is why Golden Curry Kale is one deliciously healthy recipe you’ll return to again and again. And when you’re craving something warm and nourishing, this vegetable-based comfort food will be exceptionally kind to you. 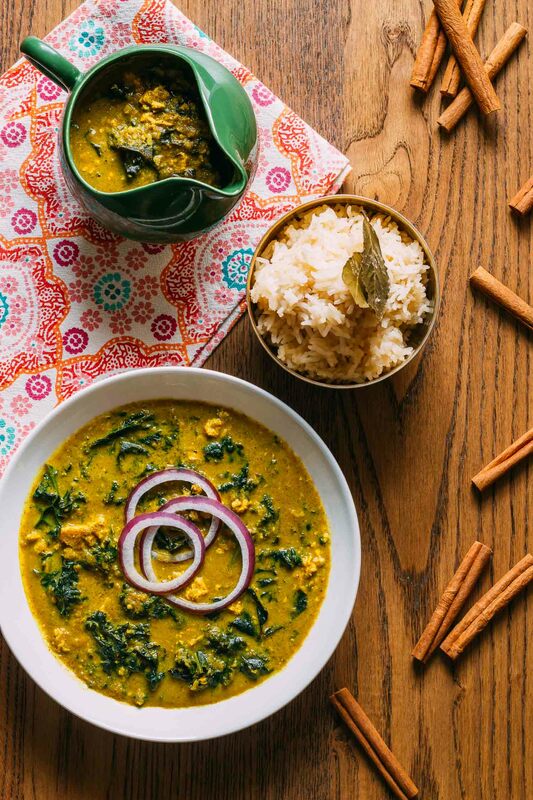 Once you enjoy a cozy bowl of heavenly Golden Curry Kale, be sure to Pin this recipe and share it with your friends. Also, feel welcomed to leave a comment and let me know how it turned out – I love hearing how it goes! Golden Curry Kale is a comforting kind of dish that leaves you feeling like gold for choosing to serve something so healthy and delicious. 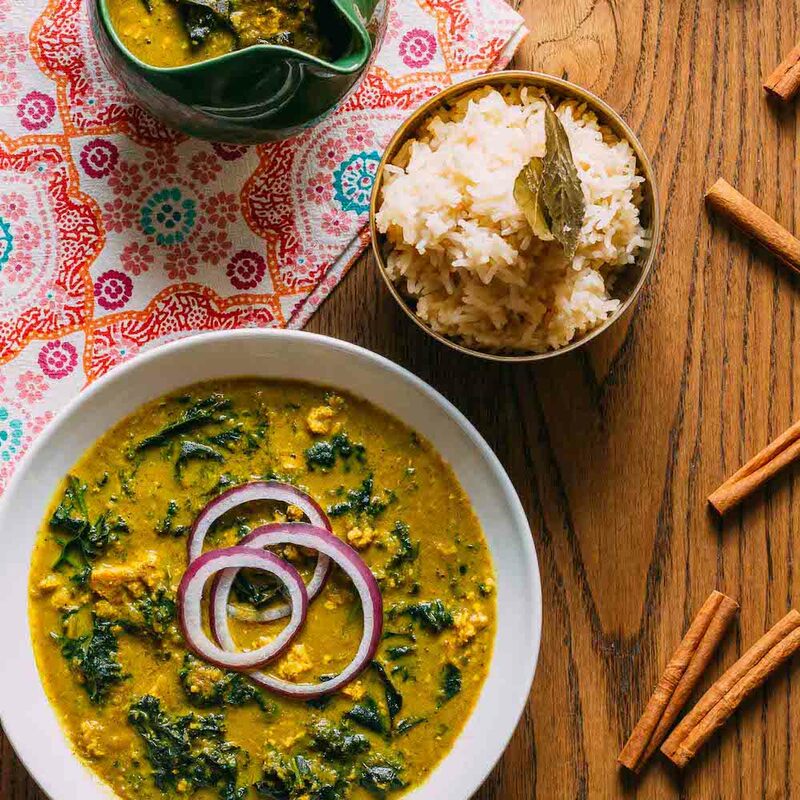 This eye-catching combo of turmeric, kale, tofu, and cashews is creamy, savory, spicy, warm, rich and its aroma is downright intoxicating! Serve it with a generous scoop of your favorite rice or quinoa to sop up all of the curry gravy – you won’t want to miss a drop! 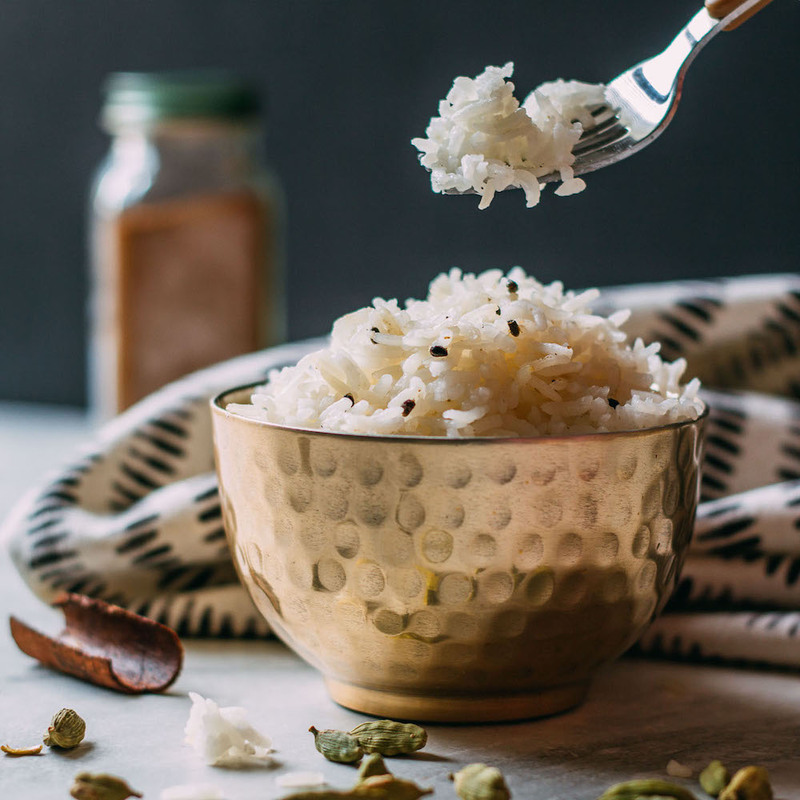 Better yet, pair this with this recipe for Creamy Savory Cardamom Rice – you’ll thank me later. 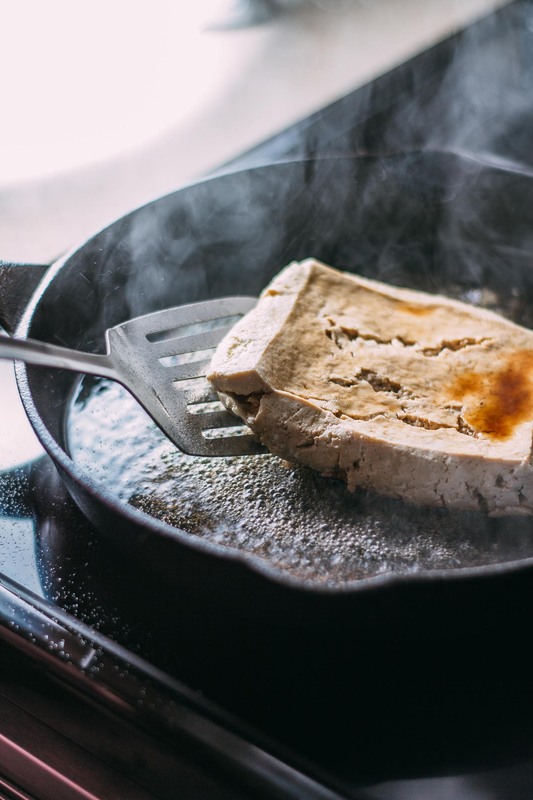 First, in a large, dry iron skillet over medium-high heat, or another quality skillet, sear the pressed tofu on each side until lightly browned. Be sure to use a squirt of Bragg's and a quarter cup or so of water to keep the tofu from sticking and impart a bit of color and flavor. Cook for just a couple of minutes on each side and then remove the tofu from the pan and set aside. In the meantime, in a food processor, combine the onion and coconut flakes and grind until it forms a smooth paste. Now, add the pureed onion and coconut mixture and saute it along with the spices until the onion is soft and the aroma awakens your soul. Add the finely chopped garlic, cayenne pepper, salt, and lemon juice. Stir, allowing everything to cook, briefly, maybe a minute or so before adding the coconut milk, other nut milk. & maple syrup. Stir again to make sure that the everything is fully incorporated and simmer, covered, for 15 minutes over medium-low to low heat. Finally, stir in the kale and cinnamon stick and simmer for another 5 to 10 minutes or until the kale is cooked to your liking. Taste and adjust the seasoning as needed. Gently crumble bite-size nuggets of tofu into the curry and stir. 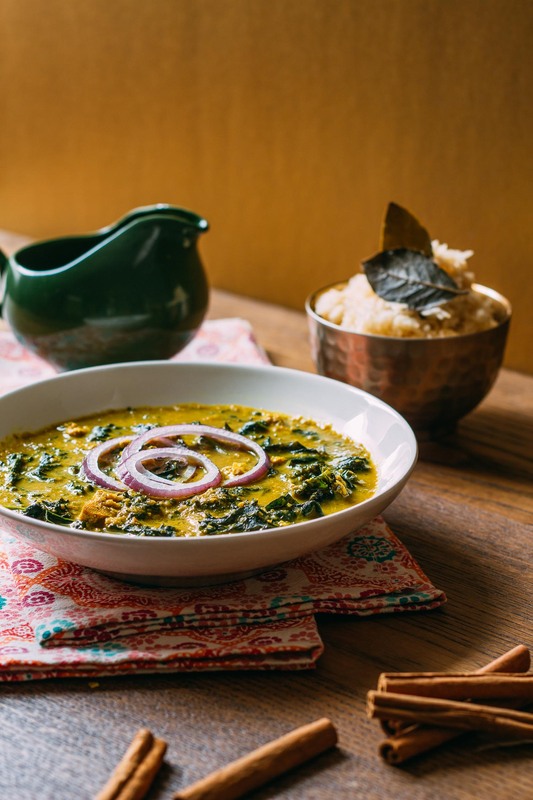 Serve your lovely Golden Kale Curry in a bowl along with a mound of rice or quinoa and wonderfully crisp rings of raw red onion. When warming up a bowl of Golden Curry Kale to enjoy for lunch one day, in addition to the red onion, I topped it off with raw pumpkin seeds and quartered gourmet tomatoes. It tasted terrific! I'll likely spin that combo into a new recipe very soon because I enjoyed the added crunch of the pumpkin seeds. And if you ever wish to amp up the protein even further, add a scattering of black beans rinsed, drained and soaked in a quirt or two of Bragg's Liquid Aminos along with a sprinkling of fresh cilantro. Adding the beans is budget friendly as it stretches the recipe to feed a few more people. I'll likely spin this winning combo into a new recipe very soon, too! Should you prefer to omit, the seasoned tofu can easily be left out without altering the deliciousness of your Golden Curry Kale. 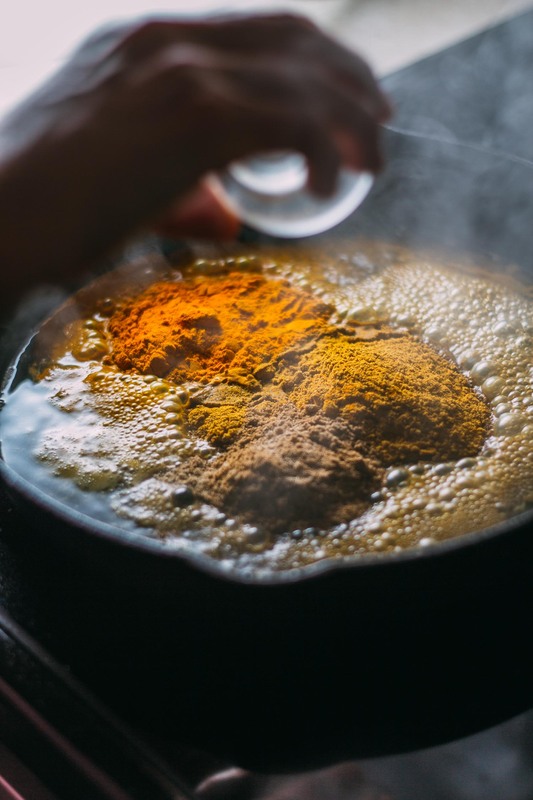 The orange colored curry powder link provided in the ingredients list has been updated to share my FAVORITE curry powder brand so far. The link offers three jars at the most competitive pricing I could find. I don’t see cashews in the recipe, but in the introduction? Am I missing something? Good question! Thank you for asking and for reading the introduction, Daniel. You didn’t miss a thing. 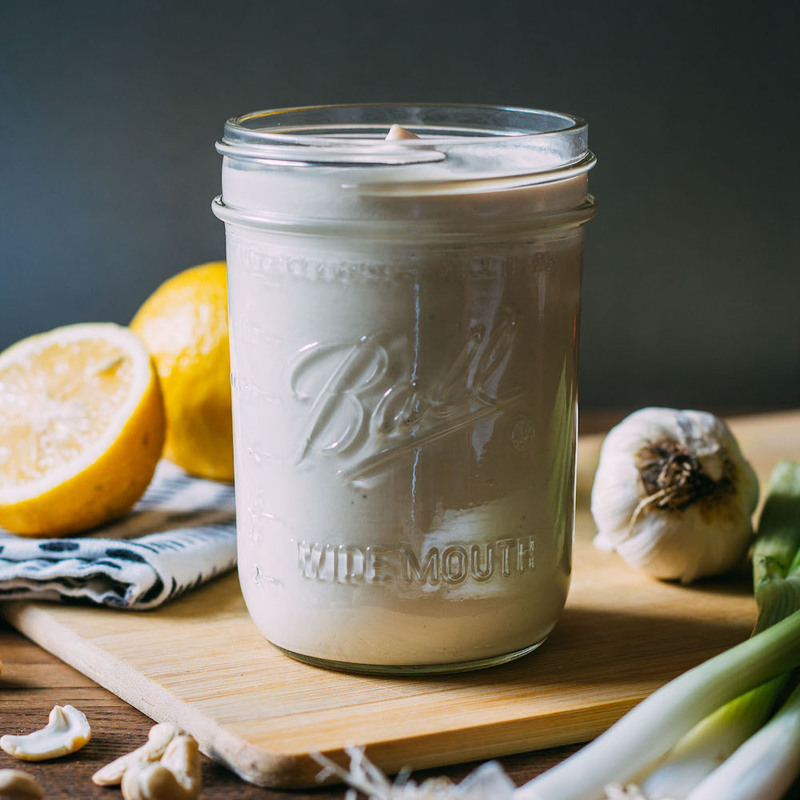 As I tested this recipe, at one point, I used cashews as the cream base rather than coconut milk. Upon further consideration, I removed the cashews deciding upon the coconut milk instead to keep the recipe budget friendly.